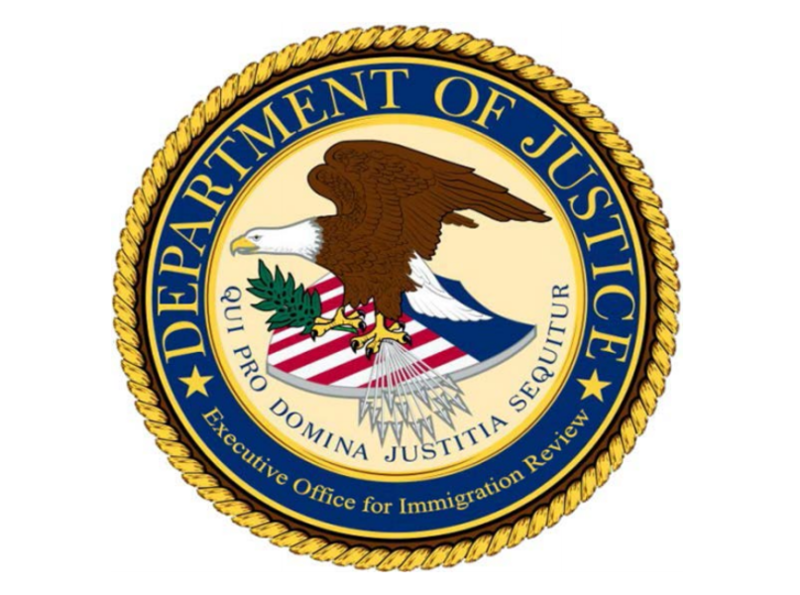 Official seal of the Executive Office of Immigration Review, which operates the U.S. immigration courts. I got kicked out of a public, federal immigration court hearing yesterday because I’m a newspaper reporter. And it wasn't the judge who wanted me to leave. It was the Immigration and Customs Enforcement attorney. Here's what happened. For several months, I've been observing the immigration court in San Francisco. Mostly I've sat in on bond hearings and "removals," more commonly known as deportations. The entire time, ICE attorneys and private security guards have been attempting to limit my access. At 1 p.m., I walked into Courtroom 18, inside the 100 Montgomery Street offices of the Department of Homeland Security, to observe several deportation cases on Judge Joren Lyons' calendar. I quietly sat down in the second row to the back. Eight other people, family members of two individuals whose cases were on the calendar, were also present. When the judge entered, he asked those of us sitting in the public seats if we were there for a particular case. The others all replied affirmatively, but none of them was made to identify their profession, state their name, or produce any identification. The judge then asked me. "I'm here to observe," I answered. And the judge had no problem with that. According to the official rules of the Executive Office of Immigration Review, which runs the immigration courts, hearings are generally open to the public unless a specific case involves an asylum request or an abused child or spouse, or where a sealed protective order has been filed. Parties to a case can also submit motions to the court in advance of a hearing to request it be closed. And judges have discretion to close hearings to protect parties, witnesses, and the public interest. But, generally, immigration courts are supposed to operate transparently. Open hearings that are accessible to everyone, including reporters who let the public know what their government is doing, are in the public interest. But before Judge Lyons could begin, the ICE attorney seated in the front of the courtroom turned around and looked straight at me. "Who are you?" he asked. I responded with a question of my own: "Why do you want to know?" "Are you a member of the press?" he questioned me. I didn't answer his question. Instead, I asked again why he wanted to know if I was a reporter. "I have a right to know if you are media," he said. "We have procedures." At that point, I politely said I wasn't aware of any rules requiring observers in the courtroom to identify themselves, on demand, to the prosecuting attorney. The ICE attorney, Michael Alster, then asked the judge for a delay. "I want to take care of this situation with this gentleman first," he said while walking out of the courtroom. I told Alster on his way out I'd like to speak with his supervisor, as well. While the ICE attorney was gone, Judge Lyons allowed the family members of one of the men on trial to talk to him through the teleconferencing system. They gathered in front of the camera, laughing and smiling, and asked the man, who was appearing via video stream from a distant jail, how he was doing. The judge also accepted from the family some documents they had brought to support his case. At this point, it's worth noting that I didn't know anything about the man's case. I didn't go into the courtroom to report on his hearing, nor the seven other people whose cases were on the judge's calendar. I was there, in fact, working on a story about how the immigration courts operate. One thing I did note while sitting there: The man whose hearing was underway had no attorney. His family hadn't hired one, either. Lots of people facing deportation can't afford counsel, and are therefore deprived of professional legal advice. It's a common problem in immigration courts. They go up against ICE attorneys on their own. 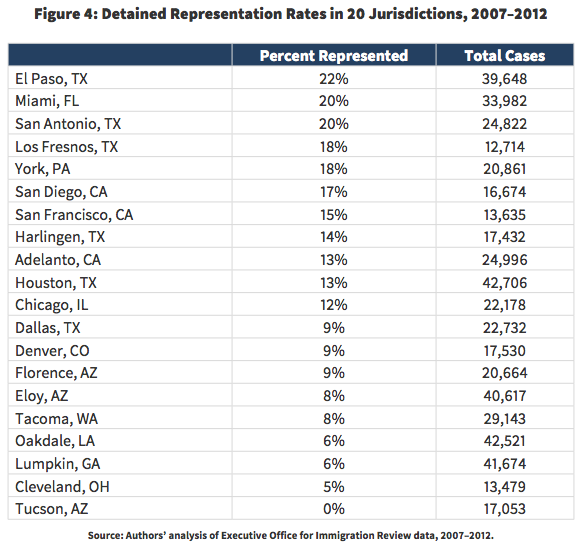 In San Francisco's immigration courts, only 15 percent of people in detention are represented by an attorney. State and local officials recognize this problem and are currently considering legislation that would provide legal representation to Californians in immigration courts. But under existing federal rules, even indigent children are left to represent themselves, or hire their own attorneys. About ten minutes later, Alster returned. He paused at the bench where I was sitting and informed me that his supervisor, Leslie Ungerman, has an office on the second floor. With that, I figured Alster had dropped his demand that I identify myself, but I was wrong. He took his seat at the front of the courtroom, and as the judge was filling him in about the new documents, Alster shifted gears. "The Department [of Homeland Security] wishes to express concern that he did not identify himself," said Alster, referring to me. He then claimed that the "respondent," the man he was trying to deport, should be concerned about his privacy because I was in the courtroom. Judge Lyons' response to the ICE attorney was that, while the courts are considered "generally open to the public," he would inform the man whose hearing was supposed to be underway about the government’s "concerns." Lyons asked the man on the screen whether he was concerned about my presence. "I don't see anything wrong with it," the man answered. Yet Alster persisted. He told the judge that information, including the man's criminal record, could end up in the newspapers. The judge relayed this claim. That prompted the man to say he was, in fact, concerned. Who wouldn't be? Judge Lyons then, reluctantly it seemed, asked everyone except family members to leave the court. I initially ignored the request from the judge, due to the fact that it wasn't an order. There hadn't been motions submitted to the court to hold a closed hearing. If the ICE attorney was genuinely concerned about anyone's privacy in that particular case, he could have submitted a motion well in advance. Judge Lyons then basically admitted he couldn't bar me from staying, but he explained that he’d have to consider canceling and rescheduling. At that point, I asked the judge to inform the man on the screen that I wasn't going to put anything about him in any newspaper, but that I would probably write about "the behavior of the ICE attorney." I then requested the judge to ask the man again if he'd be OK with me staying on those terms. The man seemed OK with this, but I got up and left the courtroom, anyway. I didn't want to be inconsiderate to him, and his family, or further delay his case. I took the elevator down to the second floor and asked for Leslie Ungerman, the chief counsel of ICE's San Francisco Field Office — and Alster's boss. Earlier that morning, I had been in a different courtroom, located on the fourth floor of the DHS building on Sansome Street. Immediately when I walked into the courtroom, the ICE attorney turned and scowled at me. I took a seat and flipped open my notebook. I was the only person there besides the ICE attorney and the translator. The judge was in chambers. The image of a man in custody appeared on a screen, head down, waiting. The ICE attorney then asked me, "Are you here for a case?" "No," I said. That was the truth; I was there to observe the operations of the court, not report on specific cases. The ICE attorney turned away, but seconds later he swung back around in his chair and questioned me: "Are you with anyone?" I knew what he was getting at, so I came right out and said, "I'm news media." Then I asked him, "Who are you?" "Assistant chief counsel," he said in an unfriendly tone. Over the past couple months, I've experienced similar behavior from ICE attorneys, some of who seem to think it's strange that anyone would want to observe the inner workings of San Francisco's immigration courts, and who seem to be hostile to the presence of a journalist. After listening to my concerns about the conduct of two of her ICE attorneys, Ungerman told me that court proceedings are open to the public and that the Department of Homeland Security wants to be transparent. She said, however, that Alster's effort to have me removed from court was likely her fault. Ungerman explained how, last week, she held a meeting with her attorneys to go over what she said were recently raised concerns involving privacy, the news media, and potential safety issues in the courts. She said that, in some cases, there is sensitive information discussed during hearings, including criminal histories. In the past, she added, some people have complained that information about them was made public, and that a judge never asked them if they wanted a closed hearing. Ungerman basically said her office is trying to protect the privacy of the people they're simultaneously prosecuting, people who tend to not have an attorney of their own. I've covered many different state and federal courts as a reporter. I've followed cases involving closed hearings, sealed documents, and complex privacy issues. But I have never before had a prosecuting attorney demand that I identify myself in a court hearing that was open to the public. And I've never seen a prosecutor offer legal advice about privacy to the person he's prosecuting in an attempt to expel a suspected reporter from the courtroom. But to be honest, I've never seen anything like San Francisco's immigration courts. Last year, the first time I tried to attend court at the DHS building at 630 Sansome Street, a private guard with Paragon Systems, which contracts with the government to secure the building, told me I wasn't allowed inside unless I had "an appointment" or "official business" of some kind. I informed him I was a newspaper reporter and that I wanted to observe court hearings. That was my official business, I said. He claimed this wasn't permitted and then directed me out of the building. The first time I tried entering the immigration courts in the DHS offices at 100 Montgomery Street, another security guard told me I could only pass through security if I was there for a specific court hearing involving myself or a family member. Needless to say, I kept going back. But it's clear that San Francisco's immigration courts have a problem with transparency.